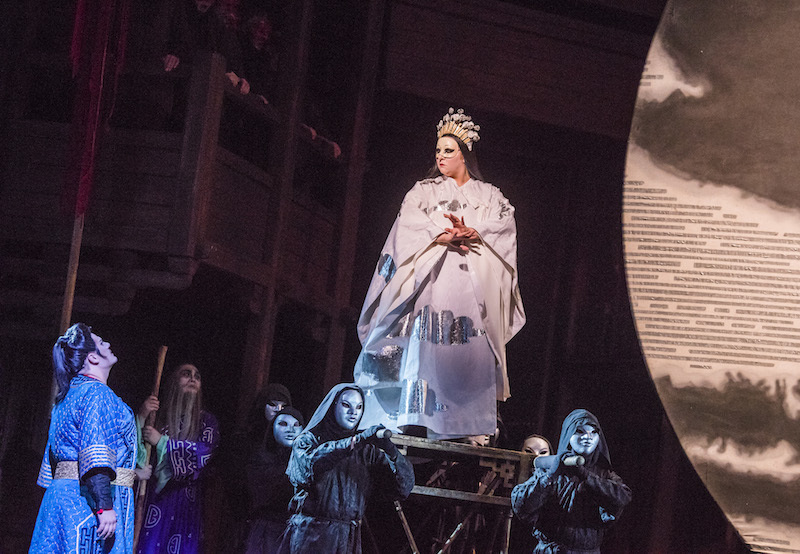 Nobody ever talks about Graham Vick’s 26-year-old production of Mitridate, re di Ponto – it seemed to have sunk without trace – but Covent Garden’s revival is a reminder of how stunningly original it was, and still is. Mozart composed this work when he was fourteen, and had to endure endless interference from singers who wanted ever more showy arias, but as it progresses you can sense him finding his true voice. The plot unfolds on the shores of the Black Sea around 60BC, and turns on the fact that King Mitridate’s sons – the noble Sifare (here sung by Salome Jicia) and the treacherous Farnace (Bejun Mehta) – are both in love with his betrothed, Aspasia (Albina Shagimuratova). The rudimentary characterisation is geared to the required happy ending; the whole work is about emotional effect – as is the staging. Vick and his designer Paul Brown – plus lighting designer Nick Chelton and choreographer Ron Howell – create a feast for the eye, with extravagantly panniered and hoop-skirted figures moving in slow motion through an abstract environment of glowing reds, blues, and yellows. The hieratic choreography has echoes of Japanese Noh and Javanese shadow-puppetry, with one character – the Parthian princess Ismene (Lucy Crowe) – moving like an Indian temple dancer. It’s all gently surreal, and absolutely mesmerising. And we get singing of an exceptional order. Georgian soprano Salome Jicia’s Sifare is delivered with mercurial grace, while countertenor Bejun Mehta’s Farnace has a beguiling subtlety of sound. Albina Shagimuratova took a while to settle into her part on the first night, but gave a ravishing aria at her character’s moment of despair. Tenor Michael Spyres sings the title role with expressive warmth and phenomenal vocal agility, while Lucy Crowe, as Ismene, brings down the house with a soprano artistry beyond compare. Christophe Rousset’s conducting and continuo-playing is juste a point. 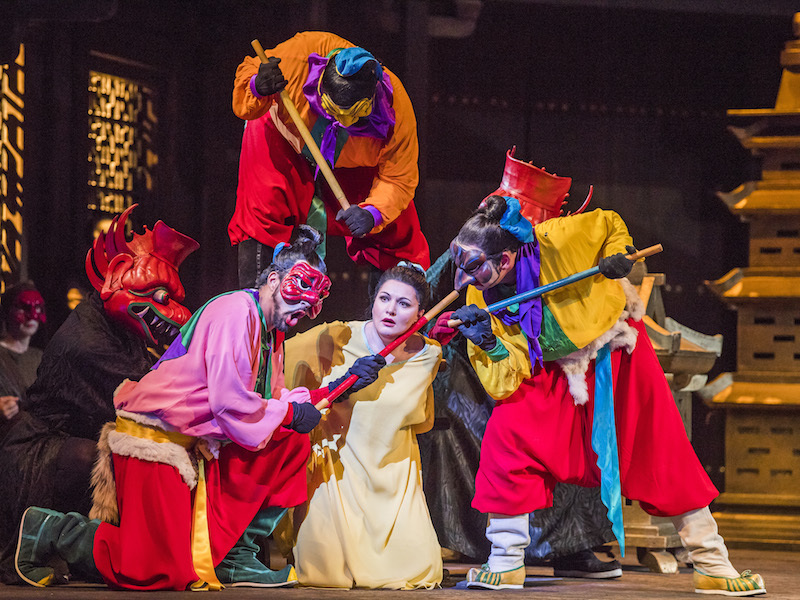 When a show has been running as long as Andrei Serban’s 33-year-old production of Puccini’s Turandot, we tend to take it for granted, as though the only question in any revival is how good the soloists are. But the way it’s put together deserves mention, and explains that longevity. Choreographer Kate Flatt, who was working on the equally long-running Les miserables at the same time she was working on this, and whose whirling dancers set the visual tone throughout, took her inspiration from t’ai chi and the ritual gestures of karate. This grounding in ancient forms is why the show still doesn’t feel dated. The siting of the huge chorus round the back of the stage, as though inside a giant drum, allows their sound to come at us with massive force, blending with the orchestra at its loudest. The costumes, all in raw silk, are as varied as they would have been on the streets of imperial China. The doomed Prince of Persia is a hauntingly vulnerable and other-worldly creation. Some of the players on the gongs and giant tam-tam have been with the show since its inception. Everything reinforces the realism of this perennially gripping melodrama. 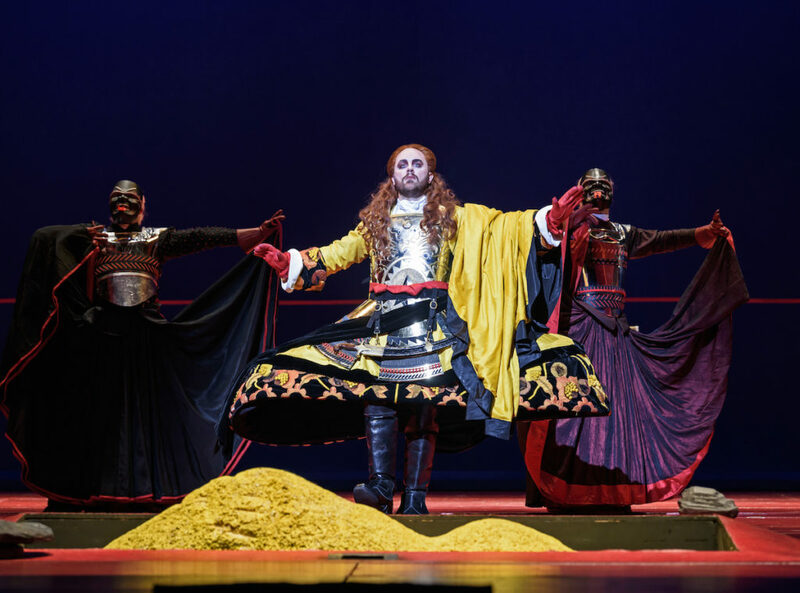 In Aleksandrs Antonenko as Calaf and Christine Goerke as Turandot we get a suitably resonant central couple, while Hibla Gerzmava, as the slave-girl Liu, steals the show in both her big arias with a gloriously full and sweet sound. And there are no weak links in the rest of this vocal chain, anchored by Turiy Yurchuk’s Mandarin, In Sung Sim’s graceful Timur, and Robin Leggate’s commanding Emperor Altoum. As Britain’s City of Culture for 2017, Hull is putting on an impressive show, with an event of some sort almost every day. Last Saturday the city was showing a gay leg in many senses of the word: while the streets of the picturesque old port were filled with garlanded members of Hull Pride, and echoing to the sound of clog-dancers and Morris men, the historic dry dock hosted the Proms’ first foray north of the M25 since the 1930s. 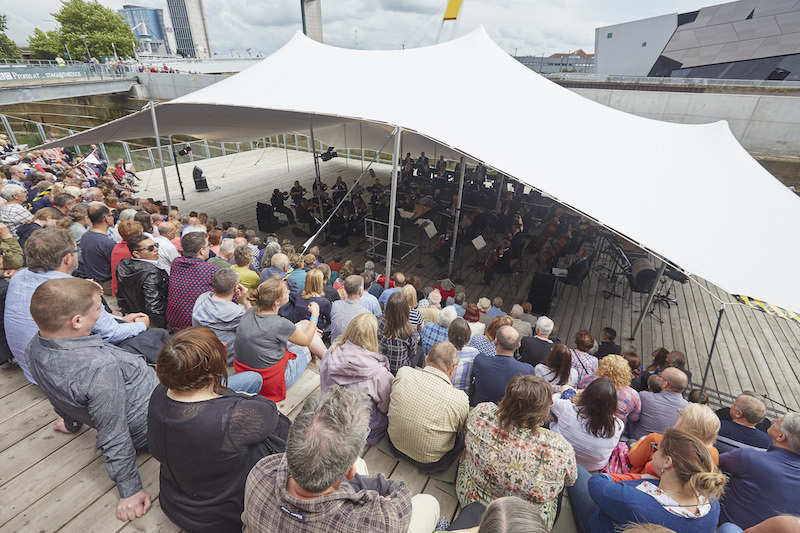 Moreover, the programme of the Royal Northern Sinfonia under Nicholas McGegan’s direction marked an anniversary of a different sort: 300 years since Handel’s Water Music got its first airing on the Thames for a barge party led by George I. It sounded pretty good here, as did Telemann’s Water Music which had been composed for a civic dinner in Hamburg a few years later. Indeed, the whole programme consisted of music inspired by water, including Delius’s Summer Night on the River, Mendelssohn’s Calm Sea and a Prosperous Voyage, and a specially commissioned work by Grace Evangeline Mason entitled River which, to be frank, didn’t live up to its florid advance publicity. Two other programmed works were not performed because a gale suddenly whipped up and rain began to fall in sheets. OK for the orchestra, snug under their awning (instruments can’t be allowed to get wet), but not so great for the little audience, who were forced to huddle under whatever individual shelter they had thought to bring, because no awning had been provided for them. They were astonishingly good humoured about it all, but to freeze and drench your audience must count – at the very least – as shockingly bad manners. As this event was hugely appreciated, however, the Proms should definitely come back – with an extra awning – next year.